Monsanto Co. has shelved plans to offer its genetically engineered spring wheat to farmers, a plan that had created worldwide opposition from food manufacturers, environmentalists and consumers. In its decision Monday, the St. Louis-based company cited economic factors, including a 25 percent decrease in U.S. and Canadian spring wheat acreage since 1997 and a lack of "widespread industry alignment" behind biotech wheat. One opponent said the company was "in full retreat." Monsanto had hailed the development of its wheat variety made resistant to the company's own Roundup herbicide. The genetic changes, the company said, would allow a farmer to spray the herbicide without harming the wheat plants. 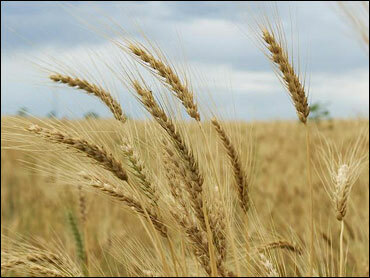 But genetically altered wheat has been a tough sell, with some foreign importers indicating they will not buy it. While biotech corn and soybeans primarily go into livestock feed and additives, wheat is generally used for bread and other human foods. The company will continue to monitor the wheat industry's desire for biotechnology to determine "if and when" to reconsider developing biotech wheat, said Carl Casale, Monsanto's executive vice president. Meanwhile, Monsanto will continue to seek regulatory approval for the wheat trait. "This isn't the end of biotech in wheat," said Daren Coppock, chief executive officer for the National Association of Wheat Growers, which supports Monsanto's biotech efforts. "This is just a decision by Monsanto that the market's not ready yet." Gail Wiley, a North Dakota farmer speaking for the Western Organization of Resource Councils, called the announcement "a victory for farmers in the United States and Canada and our consumers overseas. After five years of effort, we finally convinced Monsanto to face reality: Our markets do not want Roundup Ready wheat." Joe Mendelson, legal director for the Washington-based Center for Food Safety, an opponent of genetically engineered crops, said Monsanto "has run up against the reality of market rejection from both farmers and consumers and they realize that basically no one wanted this stuff. They're in full retreat." Japan, America's top wheat importer, has said it will accept no wheat - conventional or biotech - from any nation that grows biotech wheat. Opposition to genetically modified food is also strong in Europe, where it's often derided as "Frankenfood." Monsanto had been developing a Roundup Ready variety of hard red spring wheat since 1997. Tests by company scientists as well as academic researchers showed that Roundup Ready wheat offered the potential to increase yields by up to 15 percent, Monsanto said. Now, Monsanto said it will focus on development of new and improved biotech traits in other crops. The company has created genetically modified corn, soybeans and cotton. Monsanto's investment in wheat in fiscal year 2004 has been less than $5 million, or less than 1 percent of the company's $500 million research and development budget, company officials said. Some farm and consumer groups asked the government last year to suspend development of the biotech grain. In a petition filed in March 2003 with the Agriculture Department, the groups said wheat genetically designed to tolerate Roundup could lead to grain mix-ups in the field and in shipments, making some exports unacceptable to trading partners who oppose biotech crops. Spring wheat is grown primarily in North Dakota, Montana, South Dakota and Minnesota. Kansas, the nation's largest wheat grower, mostly grows winter wheat varieties that need less weed-resistance.